The Tax Court designated nine orders this week; we’ll discuss three here. The others included two fairly routine orders granting motions for summary judgment in CDP cases; another reminder that parties can’t use Rule 155 computations to alter substantive litigated issues; a cryptic order from Judge Carluzzo in a case we previously covered, which seems to suggest that these pro se petitioners disagreed with Judge Carluzzo’s denial of their motion to dismiss for lack of jurisdiction; and a pair of orders from Judge Leyden, one of which warns of a section 6673 penalty. Judge Carluzzo issued a bench opinion in Pagano, upholding Respondent’s changes to Petitioner’s 2014 and 2015 income taxes in a Notice of Deficiency, along with an increased deficiency that Respondent desired after the NOD was issued. Petitioners made this all the easier on Respondent when they failed to appear for trial. While the opinion is run-of-the-mill, it provides a useful distinction between the various burden of proof rules that can apply in Tax Court. Usually, Petitioner bears the burden of proof—including the burden of producing evidence and the ultimate burden of persuasion—in any Tax Court case. The Notice of Deficiency is “imbued with a presumption of correctness”; in other words, if Petitioner puts on no evidence, then Respondent’s changes in the NOD are upheld. This dynamic shifts, however, where (1) Respondent raises a “new matter” that is outside the scope of the Notice of Deficiency, or (2) the NOD provides for an adjustment based on unreported income. In the former case, because the new matter was not contemplated at the administrative level, Respondent must both raise the issue and provide foundational evidence to support such an adjustment. For unreported income, the Tax Court has repeatedly held (as Caleb Smith discussed previously) that Respondent cannot rely on a “naked assessment” regarding unreported income. Otherwise, taxpayers are forced to prove a negative. Instead, Respondent must first link the taxpayer to an income producing activity. In Pagano, the substantive issues included overstated Schedule C deductions for 2014 and 2015, and understated Schedule C income for 2015. The Petitioners lose on the deductions for both years under the general principle that the petitioner carries the burden of proof. Missing trial is a good way to fail to carry that burden. In contrast, Respondent had some work to do on its adjustment for understated Schedule C income—not much work, but Respondent needed to do more than simply showing up to trial, sitting on its hands, and saying “we win.” Nevertheless, Respondent still wins. Because Respondent introduced evidence to connect Petitioners to an income producing activity—namely, Petitioner’s tax preparation business—its adjustments regarding unreported income were likewise upheld. It helped that Respondent also seems to have provided evidence to justify the underlying adjustments, but I’m not sure that would have been necessary with absent petitioners. Finally, Respondent seems to have concluded that the Service’s earlier bank deposit analysis on unreported income was somewhat off. Therefore, Respondent sought an increased deficiency from that reported in the NOD. Here too, Judge Carluzzo finds that Respondent satisfied its independent burden in raising this new matter, through the bank deposit analysis that Respondent entered into evidence, along with a revenue agent’s testimony. This order from Judge Holmes comes on a motion for extension of time to file a motion to reconsider Judge Holmes’ prior order denying Petitioner’s motion for reasonable litigation and administrative costs under Rule 231. That order, which Judge Holmes issued on December 21, 2018 and did not designate, disagreed with the Court of Federal Claims’ decision in BASR Partnership v. United States, 130 Fed. Cl. 286 (2017), that partnerships could submit Qualified Offers under section 7430(c)(4)(E)(i). In this order, Judge Holmes explains his disagreement with the Court of Federal Claims in detail. Hold on a second. Did an undesignated order just create a split of authority between the Tax Court and the Court of Federal Claims? Well, not necessarily. Orders are, under Tax Court Rule 50(f), non-precedential. Other judges in the Tax Court might reach a different result. Of course, a partnership shouldn’t expect to return to Judge Holmes with an identical argument and hope to win; he’s likely to apply the same logic as in Hurford Investments. After losing their motion for fees and costs, Petitioners planned to move for reconsideration. But their counsel knew that the decision in BASR Partnerships—which the Service appealed to the Federal Circuit—would soon be forthcoming. Indeed, the Federal Circuit issued their opinion on February 8, as we covered here. So, Petitioners moved on January 17 for an extension of time to file their motion for reconsideration, such that the Tax Court could consider any subsequent opinion from the appellate court. Judge Holmes denied the motion for an extension of time, noting that there were alternative grounds for decision, which the Federal Circuit was unlikely to reach. I initially had some trouble seeing that argument. The grounds for decision were (1) that Hurford wasn’t a prevailing party in the traditional sense because Respondent’s litigating position was substantially justified, and (2) that Hurford couldn’t make a Qualified Offer as a matter of law. Presuming the first point is correct (a fair assumption, given the novelty of the underlying case), the Court must still find that Petitioner was prevented from submitting a qualified offer. Let’s take a look at the statute and Judge Holmes’ analysis. Section 7430 authorizes reasonable litigation costs where the taxpayer is the “prevailing party,” which means (1) that the taxpayer won a litigated case, and (2) that the IRS litigating position was not “substantially justified.” See I.R.C. § 7430(c)(4)(B). However, a taxpayer can avoid the “substantially justified” provision if the taxpayer submits a “qualified offer”, as defined in the statute, and if “the liability of the taxpayer pursuant to the judgment in the proceeding . . . is equal to or less than the liability of the taxpayer which would have been so determined if the United States had accepted a qualified offer . . . .” I.R.C. § 7430(c)(4)(E)(i). Remains open during the period beginning on the date it is made and ending on the earliest of the date the offer is rejected, the date the trial begins, or the 90th day after the date the offer is made. However, section 7430(c)(4)(E)(ii) provides that a qualified offer isn’t available in “any proceeding in which the amount of tax liability is not in issue….” Judge Holmes previously found that this was such a case. The ultimate tax liability is not calculated at the partner level in a TEFRA proceeding; instead, the tax liability of the partners is separately calculated, and can depend upon individual circumstances independent of those addressed in the TEFRA proceeding. Further, Judge Holmes found that Hurford Investments wasn’t even a “taxpayer” under section 7430, because it has no ultimate tax liability that is calculated, and so couldn’t even make an offer as required under 7430(g)(2). Similarly, Judge Holmes suggests Petitioner didn’t comply with section 7430(g)(4), which requires taxpayers to specify the amount of the taxpayer’s liability. Hurford Investments couldn’t have done so, Judge Holmes suggests, because they had no liability as a partnership. Finally, the regulation interpreting this section requires the taxpayer to “clearly” make their qualified offer, and also requires that it be “with respect to all of the adjustments at issue” and “only those adjustments.” 26 C.F.R. § 301.7430-7(c)(3). Judge Holmes seems to state that because offered the adjustments at the partnership level flow through to the partners—i.e., that Hurford Investments’ proposal wasn’t limited to only its tax liability, but extended to their partners—this wasn’t a proper “qualified offer” under the regulation. This latter point must be the “alternative grounds” upon which Judge Holmes denied the motion for an extension of time. All other grounds that Judge Holmes rejected stem from the premise that Hurford Investment didn’t have a tax “liability” and, relatedly, that the tax liability cannot be at issue in a TEFRA proceeding. As it happens, the Federal Circuit issued their opinion shortly after this order, after which Petitioner filed a motion for reconsideration. We’ll continue to wait and watch this not-yet-ripe split of authority develop. Finally, this order provides an example of the Court addressing a gap in the rules in an interesting context. Judge Holmes decided this TEFRA case in 2017 (T.C. Memo. 2017-151). Turns out, an indirect partner didn’t participate in that litigation. When parties to a partnership action settle, Rule 248(b)(4) requires Respondent to move for entry of decision; the Court then must wait 60 days to see if any nonparticipating party objects to the settlement. The Rule exists to provide the nonparticipating, though very affected, party one last shot to participate in final disposition of the case. There’s no similar rule, however, where the case is litigated. Indeed, the equity interests are somewhat different here, since the Court is ultimately calling the shots. In this case, the participating parties did agree on the “language of the decisions”—which I take to mean the decision documents that will ultimately resolve this docket after Judge Holmes decided the substantive issues in 2017. So, it appears, the parties and Judge Holmes felt that this nonparticipating party needed a chance to voice its opinion on this final decision. As such, the Court served the proposed decision on the partner (an estate), and issued an order to show cause why the Court shouldn’t enter that decision. They used the procedures in Rule 248(b)(4), and so provided the estate with 60 days to respond. The estate responded and filed a motion for leave to intervene. Petitioner consented to the motion, but Respondent objected, arguing that the motion was untimely and otherwise inappropriate on the merits. Judge Holmes finds that the motion to intervene was timely; it was timely made in response to the bespoke procedure that the parties created in this case to provide the estate with notice and an opportunity to respond. Even though the motion would be untimely under Rule 245 (which generally governs motions to intervene in TEFRA cases), Respondent had already agreed to these new procedures in this case. Professor Patrick Thomas from Notre Dame brings us this week’s designated order post. The first case he discusses raises and issue Professor Thomas and I first discussed a couple of years ago when he had a Tax Court case in which the petitioner expected a refund. He brought Rule 260 to my attention. I subsequently had my own clinic case with an unpaid refund. I pointed out the rule to the IRS attorney when I asked whether they objected to the motion I was preparing to file. The attorney asked that I hold off on filing the motion and I did. That decision led to a little tension with my client who wanted me to push harder but I felt that the attorney would work hard to get the refund issued based on her promise. She did. Only a small percentage of Tax Court cases result in a refund but a high percentage of those cases probably result in slow delivery of the refund. Understanding Rule 260 can be helpful. The Tax Court picked up the pace this week. In addition to the cases detailed below, Judge Carluzzo issued a quick reminder that, under Craig v. Commissioner, a document entitled a “Decision Letter” may instead be treated as a Notice of Determination if, in fact, the facts warrant; Judge Armen disposed of a mooted motion for reconsideration; and Judge Halpern issued a cryptic order in a Whistleblower case that struck his order in the same case the prior week (which Caleb Smith covered for us previously). This case provides two important lessons. First, failing to use the Court’s formal procedures under Rule 260 for enforcement of an overpayment may result in a tongue lashing. Second, and more importantly, there is significant dispute regarding whether the Court may order refunds for partners that result from decisions in a partnership level proceeding. The Court issued its decision in this case last year. In Judge Holmes’ view, the decision was largely favorable to Petitioners, and according to Petitioner’s counsel, resulted in a substantial refund for the partners in one tax year (along with some smaller deficiencies in others). The Service issued computational adjustments to the partners for those deficiency years, but did not issue the refunds for the other year. Instead, the Service told the partners to sue for a refund in District Court or the Court of Federal Claims. So, Petitioner’s counsel sent a letter to the Tax Court, asking the Court to force the Service to issue the refund. I’ve certainly been in a similar situation before. The Court issued a decision for my client, found an overpayment, and ordered a refund. Months came and went. Still no refund. Fortunately, the Tax Court Rules provide for a remedy: specifically, Tax Court Rule 260. In ordinary deficiency cases, the Court may order Respondent to issue a refund under Rule 260. Presumably, the Court could use its contempt power under section 7456(c) if the Service continued to refuse. Rule 260 has a few hoops to jump through. First, under Rule 260(a)(2), Petitioner may not commence a Rule 260 proceeding until 120 days have lapsed since the decision became final under section 7481(a), which for non-appealed cases means 90 days after the decision is entered. So at least 210 days from the decision must elapse before starting down this path. The Court issued its decision in Greenteam on June 21, 2017, so Petitioner would successfully jump through this hoop. However, Petitioners may not simply ask for the Court to step in without providing Respondent an opportunity to correct its mistake. Rule 260(b) specifies the content of the motion, which requires “a copy of the petitioner’s written demand on the Commissioner to refund the overpayment determined by the Court . . . [which] shall have been made not less than 60 days before the filing of the motion under this Rule . . . .” The demand also must be made to the last counsel of record for the Commissioner—not on any other Service employee. I’m not sure whether Petitioner’s counsel made this demand, but it seems as if it at least wasn’t attached to the letter sent to the Tax Court. Judge Holmes orders that the letter be treated as a motion under Rule 260, but subsequently denies that motion as being premature (presumably because no demand has been shown as made on Respondent). I quibble somewhat with that statement; 6512(a) provides that a Petitioner may not obtain a refund using other mechanisms (e.g., a refund claim or suit); subsection (a)(4) provides an exception to this rule for partner level refund determinations. Rather, section 6512(b) provides the Tax Court with jurisdiction to determine overpayments, which presumes that the Tax Court has determined whether a deficiency exists and can therefore determine whether an overpayment exists. It can’t do so directly in partnership cases, and so the argument goes, the Tax Court doesn’t have refund jurisdiction as to related partners in such cases. Still, section 6230(d)(5) provides, that “in the case of any overpayment by a partner which is attributable to a partnership item (or an affected item) and which may be refunded through this subchapter, to the extent practicable credit or refund of such overpayment shall be allowed or made without any requirement that the partner file a claim therefor.” Judge Holmes notes that secondary sources are unclear on whether, read together, these sections grant the Court overpayment jurisdiction in such a case. Judge Holmes seems willing to consider the issue, but Petitioner must first renew its request under Rule 260. First step: issue a demand letter to Respondent’s counsel under Rule 260. Or, as the Service suggested, take up the issue in District Court or the Court of Federal Claims (where the jurisdictional issue is much less murky). This order from Judge Leyden highlights my concern with the Court’s use of Designated Orders to fully dispose of cases. The facts of the case are also interesting, and a reminder to law students that they most likely cannot deduct their ever-increasing tuition payments. Petitioner was a “Patent Technical Advisor” at a large law firm, and took advantage of the firm’s offer of non-interest-bearing loans to attend law school. Mr. Banini deducted his law school tuition payments on his federal income tax return for 2013 and 2014, and eventually graduated with a J.D. in January 2015. Education expenses are deductible as business expenses under section 162 if the education “maintains or improves skills required by the taxpayer in his employment … or meets the express requirements of the taxpayer’s employer, or of other applicable law or regulations, imposed as a condition to the retention of the taxpayer of an established employment relationship….” 26 C.F.R. § 1.162-5(a). However, such expenses are still nondeductible if the education qualifies the taxpayer for a new trade or business. Id. § 1.162-5(b). So, even if the education “maintains or improves skills required by the taxpayer in his employment” (as a legal education certainly may when working as a patent agent in a large law firm), the expenses are nondeductible if the education qualifies the taxpayer for a new trade or business. In the years that Petitioner deducted his education expenses, he was a Patent Technical Advisory—not an attorney. Therefore, Judge Leyden finds that the educational expenses qualified him for a new trade or business, even though the expenses could conceivably maintain or improve his skills within the scope of his current employment relationship with the law firm. Substantively, all is well and good with this order. The legal issue is straightforward. But why dispose of this case via order at all, and not include it in the Tax Court Summary Opinion reporter? Off the cuff, reasons to not include an order in a reporter could include (1) a non-substantive order (such as an order setting a date for trial or for payment of a filing fee), (2) a concern regarding the order’s precedential effect (i.e., orders are, under Tax Court Rule 50(f), nonprecedential), and (3) relatedly, an efficiency concern regarding the opinion’s issuance procedures through the Chief Judge, which judges have previously noted as a reason to issue orders (and to designate them). This order fully disposes of a substantive legal issue in this case. There is no precedential concern, because this is a Small Case; under section 7463(b), such cases carry no precedential value. That leaves us with an efficiency concern, i.e., that it may take more time to issue the opinion via the Court’s formal procedures, and that an order may more quickly disposes of the substantive issue. The Court and individual judges must balance this efficiency concern with the public’s interest in obtaining information on the substantive legal issues. The order in Banini will not appear in searches on Westlaw, Lexis, or any other service. It appeared as a “Designated Order”, but only readers of this blog and individuals who checked the Tax Court’s website on December 13, 2018 would know this. (Searches on Westlaw and Lexis that I conducted returned no results regarding this case). Individuals searching for section 162 issues involving educational expenses and patent agents will likewise not find this case, unless they know to search the Court’s docket. A search of Westlaw and Lexis likewise revealed nothing more than a few old cases involving this fact pattern. I understand the efficiency rationale behind issuing this decision as an order. Perhaps there is some other advantage of which I’m unaware. Nevertheless, I believe this strikes the wrong balance and obscures otherwise helpful information from the public. Understanding this concern, the Tax Court might consider permitting judges to issue opinions independently in a nonprecedential small case. This would better address the efficiency concern, while allowing the public and practitioners greater access to these decisions. This may raise a separate consistency concern among the Court, but this is somewhat mitigated because the opinions are nonprecedential. Judge Armen denied Respondent’s motion for summary judgment in this CDP case involving return preparer penalties. At issue is both 1) whether Respondent compiled with 26 C.F.R. § 1.6994-4(a)(1), (2) and 2) whether that regulation is mandatory or directory. That regulation seems to require that the Service “send a report of the examination to the tax return preparer” before assessing any penalties under section 6694. Section 2 of the regulation requires that the Service issue a 30-day letter to the preparer with administrative appeal rights, unless the statute of limitations on assessment under section 6696 will shortly run. While Respondent desired summary judgment based upon the second issue—i.e., that the Service should, but need not comply with the regulations for the penalty assessments to be valid—Judge Armen did not wish to spend the Court’s limited resources to address this issue of first impression. Rather, if the Service actually had complied with the regulation, that novel issue would be mooted and the assessments upheld. Likewise, other issues raised in Respondent’s motion would be mooted if the assessments were invalid. Therefore, Judge Armen denied the motion. Judge Halpern likewise denied Respondent’s motion for summary judgment in this CDP case, apparently because neither Petitioner nor Respondent addressed a dispositive issue in the case: whether Petitioner’s failure to provided updated financial information to IRS Appeals could serve as an independent basis to uphold the Service’s Notice of Determination. Instead, the parties focused on the correctness of Appeals’ decision to treat assets in Petitioner’s trust as those held by Petitioner’s nominee. Judge Halpern allows that, if failure to submit the financials would’ve been futile (i.e., Appeals had chosen to stick to its position to deny any requested collection alternative because of the trust issue), such failure might not support affirming Appeals’ decision. But because these issues are not in the record or otherwise briefed, Judge Halpern orders Petitioner to explain this failure in more detail. Finally, Judge Gustafson denies summary judgment to Petitioner in this conservation easement case. Petitioner had requested summary judgment, asking the Court to find that Petitioner qualified for a reasonable cause exception to penalties, which were at issue due to the Court’s prior opinion upholding Respondent’s deficiency assessment. Judge Gustafson denies summary judgment rather … summarily. However, he goes on to offers some comments, designed to help the parties prepare for trial—and of general interest to practitioners. He notes that some of the arguments raised as to reasonable cause depend upon legal issues decided as a matter of first impression and upon which the Tax Court and a Court of Appeals had disagreed. These factors generally auger in favor of a reasonable cause finding, because of the uncertainty regarding a party’s position on the issue. He notes, however, that a reasonable cause finding requires examination of all of the facts and circumstances, of which the legal issue’s novelty and the circuit split are but two. Because other facts and circumstances are materially disputed, summary judgment is not the appropriate vehicle to address these issues. Tax Court update: The Court’s website announces that all of the calendars scheduled for January 28 are cancelled. Professor Patrick Thomas usually brings us posts on designated orders but today branches out to discuss an issue impacting all practitioners but of particular importance to academic clinics. All practitioners interact with the CAF unit at the IRS in order to submit their power of attorney (POA) forms. If the CAF unit does not operate efficiently, the problems there multiply downstream and cause significant frustration for the practitioner, the client and for other parts of the IRS. The failure of the CAF unit to operate efficiently can cause practitioners to resort to the phone lines and engage in lengthy calls to resolve issues and obtain transcripts in situations where the IRS and the practitioner would prefer to avoid that interaction. I’m willing to bet that all federal tax practitioners have, at one time or another, experienced problems with the IRS Centralized Authorization File (CAF) Unit. The CAF Unit processes Form 2848 (among other forms), which authorizes practitioners to receive information on behalf of their clients that is otherwise protected from disclosure under section 6103. Filling out and filing Form 2848 is, in theory, relatively straightforward. List the client’s name, address, and taxpayer identification number. List the representative’s name, address, phone, fax, and CAF number. List the tax periods and tax types for which the client wishes to grant access. Have the client sign, date, and print their name. Sign and date the form yourself as the practitioner. Fax the form to the CAF Unit. Within a week or two, the practitioner should have access to the taxpayer’s information throughout the IRS, including transcripts through IRS e-Services. But sometimes the Form 2848 is rejected. Much of the time, the CAF Unit properly rejects incomplete Forms 2848. Perhaps the taxpayer or practitioner missed one of the steps above; that’s certainly happened to me more times than I’d like to admit. Other times, the CAF Unit rejects a perfectly valid Form 2848. In my prior clinical practice, the CAF Unit often did so because they believed our signature appeared to be a copy or stamped. (It was not.) (How exactly the CAF Unit can perceive a copied or stamped signature from a fax—which is, itself, a copy—I do not know). Illegibility of a name or date can also cause rejection, even if it’s the fax that causes the illegibility. In either case, the CAF Unit sends a letter to the practitioner and the taxpayer, indicating the problem it sees in the Form 2848, with a copy of the offending Form 2848 and directions for correcting the issue. When the Form 2848 is rejected for an invalid reason, numerous complications arise. First, the practitioner doesn’t have access to the taxpayer’s information on IRS e-Services, making initial investigation of the tax problem fairly difficult. Second, IRS telephone assistors may be unwilling to speak with the practitioner, even where the practitioner can fax a Form 2848 to them directly. And third, but not unimportantly, the taxpayer can become confused because the IRS sends the taxpayer a copy of the POA rejection notice. The notice comes to the taxpayer with no context. The taxpayer receives it at the same time the practitioner receives notice so that the practitioner has no opportunity to explain what is happening before the taxpayer receives the notice of rejection of the POA. This frequently causes the taxpayer to believe either that they or the practitioner have made a mistake before the IRS (even when none has occurred) or that the IRS will not allow the practitioner to represent them leaving them on their own to deal with the IRS. These issues are an annoyance for most practitioners, but ultimately are surmountable. These problems multiply for academic Low Income Taxpayer Clinics, especially those that change students frequently. Per IRM 4.11.55.2.1.1, law students in an LITC may represent taxpayers if, per IRM 21.3.7.8.5, the Taxpayer Advocate Service issues a special appearance authorization (“Authorization Letter”), which we must attach to a Form 2848 on which a student representative appears. Student representative authority lasts for 130 days—about the length of one semester. Because students cycle in and out of the Clinic so frequently, most academic clinics opt to use the “substitution procedures” to change or add representatives. Per IRM 4.11.55.2.3.1.2, a practitioner may substitute authority to another representative or add another representative if the taxpayer grants this authority on the original Form 2848, Line 5a. Per IRM 21.3.7.8.5(6) an LITC Director may delegate authority to student representatives. The Director must sign the substitute Form 2848 on behalf of the taxpayer, attach a copy of the original Form 2848 that authorized the Director to add or substitute a representative, and attach a copy of the Authorization Letter. The student representative and Director also sign as the representatives. It is not feasible for LITCs to have clients sign a new Form 2848 every 4 to 6 months. IRS cases take a long time to work. Our Clinic currently has about fifty active cases; obtaining signatures for all of these clients would take up much of the first few weeks of the clinical experience. As many clinicians can attest, our clients may not respond to requests for information or documentation as quickly as we’d like. Therefore, the substitution procedures provide an expedient solution to this problem, one which is explicitly recognized in the IRM. Because of the confluence of these unique requirements, academic clinics experience a high rejection rate for Form 2848. All clinicians understand this intuitively; however, this past semester, I conducted a systemic analysis of my clinic’s Form 2848 submissions and rejections. Of the approximately 50 Forms 2848 submitted, 10 were rejected. Three were rejected for valid reasons (one student representative forgot to sign the 2848; in the other two, the student representative sent last semester’s Authorization Letter, rather than the current semester). Before delving into the reasons for the improper rejections, the CAF Unit’s notification delays deserve mention. Our Clinic’s small survey indicates that the CAF Unit consistently fails to notify practitioners of an error until about two months from the date of faxing the Form 2848. While the CAF Unit usually dates its rejection letters soon after it receives the Form 2848, we do not actually receive those letters anywhere close to their dates. One letter took nearly three months to arrive. Below, I include a table of the rejection letters I used in our analysis. * While there were 10 clients and 10 Forms 2848 submitted, there are 12 rejection letters from the CAF. This is due, as noted above, to rejection letters for both a substitute Form 2848 and original Form 2848 for the same client. This notification delay hampers effective client representation in an academic LITC. Telephone assistors routinely do not communicate with student representatives if they are not properly entered in CAF—even if a student can fax them an appropriately executed Form 2848. Students may not discover this until they must take action on a case within the two months in which the CAF Unit has failed to appropriately process their Form 2848. Unless I am physically present in the Clinic to step in and take over the conversation—a pedagogical opportunity that I do not enjoy usurping from my students—students often can make no progress and taxpayer representation suffers. On September 7, 2018, Student Attorney 1 submitted a substitute Form 2848 for our client, Client A. This included (1) an original Form 2848 signed by Client A, which authorized myself and a former student attorney; (2) the student authorization letter from TAS for Fall 2018; and (3) a substitute Form 2848 that I signed on behalf of Client A, which substituted Student Attorney 1 as the representative. The former student attorney was a student in the Tax Clinic in Spring 2018, and Student Attorney 1 was a student in Fall 2018. Response: The Form 2848 that the CAF Unit sent back to the Clinic was properly filed. Using the substitution authority granted on the original Form 2848 that the client signed, I substituted Student Attorney 1 for the former student representative. The Clinic attached the original Form 2848, which was signed by the client and both representatives. I signed the substitute Form 2848 as the taxpayer’s POA, and both I and the new student representative signed as representatives. Finally, the Clinic attached the student authorization letter from the LITC Program Office for Fall 2018. We did not indicate that we wanted an existing POA to remain in effect. Had we so indicated, we would have checked Line 6 on the Form 2848. Line 6 is blank on the substitute Form 2848. Student Attorney 2 submitted a substitute Form 2848 for Client C on September 5, 2018. This fax submission contained the following documents, in this order: (1) fax cover sheet, (2) the Fall 2018 student authorization letter, (3) a substitute Form 2848, and (4) an original Form 2848, signed by the client, which granted authority to substitute or add representatives. “On Form 2848, you entered “student attorney”… . We need a copy of the Authorization for Student Tax Practice letter the Taxpayer Advocate Service sent you that authorizes you to practice before the IRS. Response: Letter 3 contains a substitute Form 2848 that I signed on behalf of the client as her POA on August 29, 2018. Letter 4 contains the original Form 2848 that the client signed on June 28, 2018, and which granted me authority to substitute or add representatives. It seems that the CAF Unit separated the original Form 2848 from the substitute Form 2848, along with misplacing the student authorization letter. Student Attorney 3 submitted a substitute Form 2848 for Client D on September 10, 2018. This fax submission contained the following documents, in this order: (1) fax cover sheet, (2) page one of a substitute Form 2848, (3) student authorization letter, (4) page two of the substitute Form 2848, and (4) an original Form 2848. Response: As with Letter 1, we did not indicate that we wanted an existing POA to remain in effect. Had we so indicated, we would have checked Line 6 on the Form 2848. Line 6 is blank on the substitute Form 2848. The letter from the CAF Unit attached only the substitute Form 2848 and a student authorization letter. The packet did not contain the original Form 2848. It appears that the CAF Unit separated the substitute from the original Form 2848. Student Attorney 4 submitted an original Form 2848 to the CAF Unit on July 24, 2018, which was signed by the client, Client G, along with a student authorization letter for Summer 2018. Response: The letter attached the original 2848, which was signed by the client and both representatives. It also attached the student authorization letter for summer 2018, dated May 9, 2018. This is the very document that the CAF Unit letter itself requests. While the student authorization letter limits practice to a maximum of 130 days, 130 days from May 9, 2018 is September 16, 2018. Given that the CAF Unit received the Form 2848 on July 24, 2018 and issued this letter on August 8, 2018, there is no timeliness issue. Student Attorney 4 sent a substitute Form 2848 for this client on September 5, 2018. This fax included (1) a fax cover sheet, (2) a substitute Form 2848 for Client H, which added the student attorney as a representative, and which I signed for the client (3) the Fall 2018 student authorization letter from TAS, and (4) the original Form 2848 signed by the client, which authorized me to substitute or add representatives. The CAF Unit’s letter attached the original 2848, which is signed by the client and both representatives. It does not include the student authorization letter. It seems that the CAF Unit separated the original Form 2848 from the substitute Form 2848, along with misplacing the student authorization letter. Student Attorney 1 faxed a substitute Form 2848 for these clients on September 7, 2018. These faxes included (1) a fax cover sheet, (2) a substitute Form 2848 for the client, which added the student attorney as a representative, and which I signed for the client (3) the Fall 2018 student authorization letter from TAS, and (4) the original Form 2848 signed by the client, which authorized me to substitute or add representatives. Additionally, our client delivered Letter 10 to us. The CAF Unit did not copy us on this Form 2848 rejection letter. These letters also attach only the substitute Forms 2848; they did not attach our student authorization letter from TAS or original Form 2848. It seems that for both letters, the CAF Unit separated the original Form 2848 from the substitute Form 2848, along with misplacing the student authorization letter. These rejections appear to largely to result from two separate, but related reasons, which match the shared intuition among academic LITC directors. First, it appears that the CAF Unit separates the original Form 2848 from the substitute Form 2848 and treats them as separate submissions. It then rejects the substitute Form 2848 for lacking the original Form 2848 that grants authority to substitute, and then rejects the original Form 2848 if the prior student’s 130-day authority expired or was not attached (or else, the original Form 2848 is rejected as duplicative of one already accepted). Second, the CAF Unit often separates the substitute or original Form 2848 from the Student Authorization Letter, and rejects the submission for lack of an Authorization Letter. The CAF Unit’s use of dated fax technology bears some responsibility for causing this problem. The ABA Tax Section facilitated a call in October 2018 between LITC directors and the CAF Unit director, who confirmed that the CAF Unit uses physical fax machines, rather than the e-fax process that every other IRS unit uses (at least, that I’ve worked with). Understandably, the CAF Unit receives very many Forms 2848 each day, and has a limited workforce, and so our Forms 2848 can, quite literally, be lost in the shuffle. Most Form 2848 submissions are 2-3 pages long, consisting of the two pages of the Form 2848, plus a fax cover sheet. Our submissions are often six pages long, consisting of a substitute Form 2848, an original Form 2848, a student authorization letter, and a fax cover sheet. I suspect that a CAF Unit employee may pick up only the first two pages of a Form 2848 and then disregard the remainder. Keith suggested during that call that the CAF Unit may wish to implement an e-fax solution to ensure that it receives the entire fax. I agree with that approach, and accordingly suggested this solution to the CAF Unit director. I also submitted a Systemic Advocacy Management System (SAMS) report in December, informing TAS of the above problems and proposing this as a solution. According to the systemic advocacy analyst that I spoke with, the issue is being assigned to an active task force within TAS. I encourage other academic clinicians to submit similar reports via SAMS so that the IRS has the data to support this problem’s existence. Finally, recent changes to IRS Transcript procedures will further exacerbate the issues facing academic LITCs. Last fall, the Service announced that in January 2019, transcripts will no longer be faxed to practitioners who are not duly authorized in the CAF. Any transcripts would have to be mailed to the taxpayer’s last known address. Since then, the Service has stepped back somewhat from the position, allowing that if a telephone assistor could verify a Form 2848 over the phone, then the assistor could send transcripts to the practitioner’s secure mailbox on IRS e-Services. (The ABA Tax Section submitted commentary on these changes, which appear to have helped move the needle on this issue). This is welcome news and ameliorates much of the concern for academic clinics. Nevertheless, students often encounter difficulties accessing IRS e-Services (for example, if they’ve never filed a federal income tax return or do not have loan or credit card information to verify identity). Unwarranted Form 2848 rejections cause numerous negative consequences for low income taxpayers. The letters from the CAF Unit confuse our clients; they believe that some information is required of them or that their representative has erred. The rejections can also unnecessary delay the ability of student representatives to advocate on behalf of low income taxpayers, as IRS telephone assistors often refuse to speak with student representatives if their authority is not properly registered on the CAF. Additionally, forthcoming changes to transcript delivery will require that representatives are properly verified in CAF before issuing a transcript, with some helpful exceptions. Finally, the CAF Unit takes, on average, two months to inform practitioners and/or taxpayers that a Form 2848 was rejected. The dates on the CAF Unit’s letters do not correspond to the actual dates of mailing. There is ordinarily a 45 day delay between the date on the letter and receipt in our Clinic. By the time students have faxed a Form 2848, learned of its rejection, and taken steps to fix it, the semester is essentially over. This problem can then repeat in subsequent semesters. The CAF Unit should consider implementing an e-fax solution for its incoming correspondence. Because the largest source of error appears to be separation of the faxed pages, an e-fax solution would include the precise fax that the taxpayer intended to submit. I encourage the Service to consider these changes to improve taxpayer service and ensure taxpayers’ statutory right to representation before the IRS. Guest blogger Patrick Thomas of Notre Dame Law School brings us this week’s few designated orders. He then reviews the development of the Designated Order blogging project and reports the data that the team has gathered so far. There are some interesting statistics on Designated Orders that deserve some attention. The Tax Court issued only two designated orders during this week, both of which Judge Armen wrote. I will not discuss either in depth here. For posterity’s sake, Judge Armen upheld the Office of Appeals’ decision to sustain a levy in Cheshier v. Commissioner, a Collection Due Process case in which the Petitioner did not provide financial information or tax returns in the CDP hearing. In contrast, the second case, Levin v. Commissioner, involved a very responsive CDP petitioner. In Tax Court, the parties disagreed as to the financial analysis, the propriety of filing a NFTL after entering into an installment agreement, and the necessity of filing business tax returns. Alas, the Tax Court agreed with Respondent on all counts. The order from Judge Armen merely finalized Judge Ashford’s opinion in this case (T.C. Memo. 2018-172), which I would recommend for further reading. With such a light week, this provides an opportunity to take stock of our Designated Orders blogging project, which began in May 2017. Since then, Samantha Galvin, William (Bill) Schmidt, Caleb Smith, and I have tracked every order designated on the Tax Court’s website. As of October 30, 2018, there have been 623 designated orders—though many orders occur in consolidated cases, causing the number of “unique” orders to be substantially less at approximately 525. Why do we track these orders? First, the orders often deal with substantive issues of tax procedure. Some orders could very well be reported opinions. Many of these issues—especially those arising in CDP cases—receive comparatively less coverage in the Tax Court’s opinions. Indeed, through “designating” an order, the individual judge indicates that the order is more important than a routine order (of which the Tax Court issues hundreds each day). The orders can often reveal the direction in which an individual judge or the Court is tracking on certain issues. Instead, orders are listed on the “Today’s Designated Orders” page each weekday after 3:30pm Eastern time (or, a message appears that no orders were designated on that day). At some unspecified time overnight, any record of these orders disappears. Of course, the underlying orders are themselves maintained within the dockets of their respective cases. But without knowing which orders were designated, it becomes impossible to discover them. As an aside: no compelling reason exists to hide the designated status of an order from the public. Professor Lederman’s recent post nicely encapsulates the continuing (though progressively fewer) transparency concerns that the Tax Court faces. This certainly is another; yet the Court’s historic rationale for preventing disclosure of information (the valid concern with taxpayer privacy) simply does not apply here. So, Caleb, Samantha, Bill, and I began tracking every order each weekday in May 2017. We have logged the date, docket number, petitioner, judge, and hyperlink for every designated order since then. This summer, I cleaned and analyzed one year of designated orders data from April 15, 2017 until April 15, 2018. (I acknowledge help from Bill in initially looking at this data, along with substantial work from my research assistant, Chris Zhao). In addition to the above data, I added data regarding the jurisdictional type, whether the case was a small case under IRC § 7463, and whether the order merely transmitted a bench opinion under IRC § 7459(b). I present those initial findings below. In later work, I will compare the designated orders with opinions and “undesignated” orders (some of which are indeed just as substantive as designated orders, as Bob Kamman has routinely pointed out to us). The dataset revealed 319 unique orders during the research period. 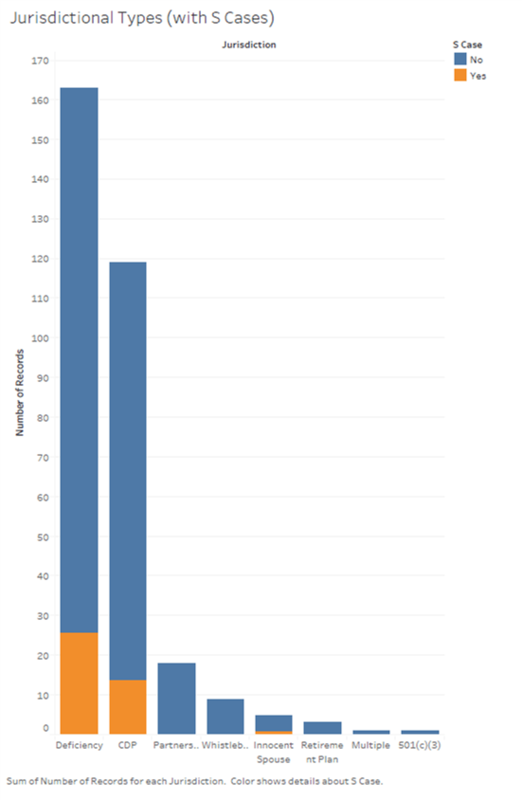 In terms of content, we have not systemically tracked the subject matter of designated orders in our dataset. From our experience, the vast majority of orders deal with substantive, often tricky issues. The one major exception is found in Judge Jacobs’ orders, which are often routine scheduling orders. We are not sure why these orders are designated, presuming the purpose of designating an order is to highlight an important case or issue. While we did not track individual issues, the dataset does contain a jurisdictional breakdown. 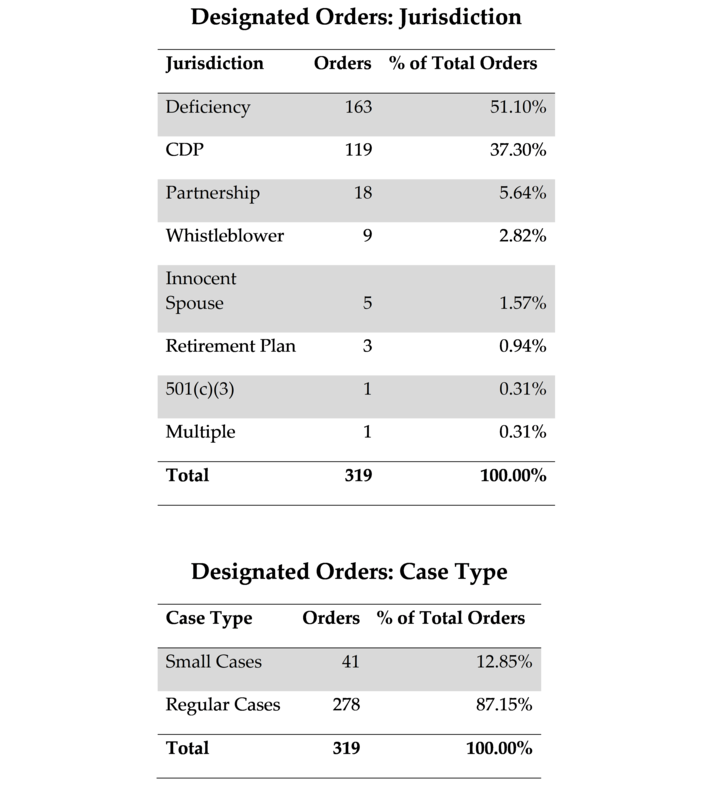 Deficiency and CDP cases accounted for the vast majority of orders (51.10% and 37.30%, respectively). Other case types included partnership proceedings, whistleblower, standalone innocent spouse, retirement plan qualification review, 501(c)(3) status revocation, and others that involved multiple jurisdictional types. 12.85% of orders were for a small tax case under section 7463. Small cases are underrepresented, compared with the Court’s 37% share of such cases generally (as of April 30, 2018, according to Judge Carluzzo’s presentation to the ABA Tax Section’s Pro Bono and Tax Clinics Committee). Certain judges used Designated Orders much more frequently than others during the period reviewed. 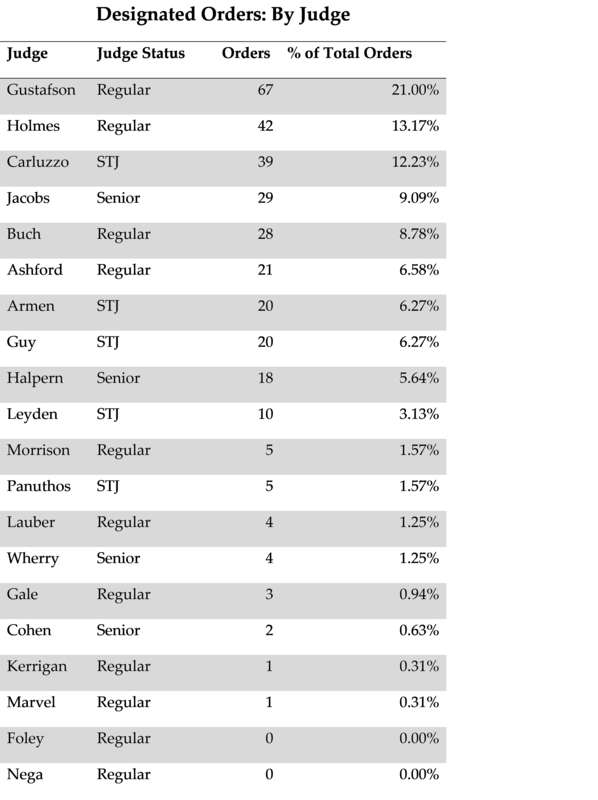 Judges Gustafson, Holmes, and Carluzzo lead the pack, having issued 46.40% of all designated orders, at 21%, 13.17%, and 12.23%, respectively. Thirteen judges (a substantial minority of the 31 active judges) did not designate a single order during the research period. Almost half of the regular judges—Judges Foley, Goeke, Nega, Paris, Pugh, Thornton, and Vasquez—issued no designated orders at all. (The Chief Judge, given their increased administrative duties, receives fewer individual cases. Further, Judge Thornton did designate two orders during May and June 2018. Judges Goeke and Vasquez, while currently on senior status, are classified in the dataset as regular judges, as they retired on April 21 and June 24, 2018, respectively.) Over half of the senior judges issued no designated orders. 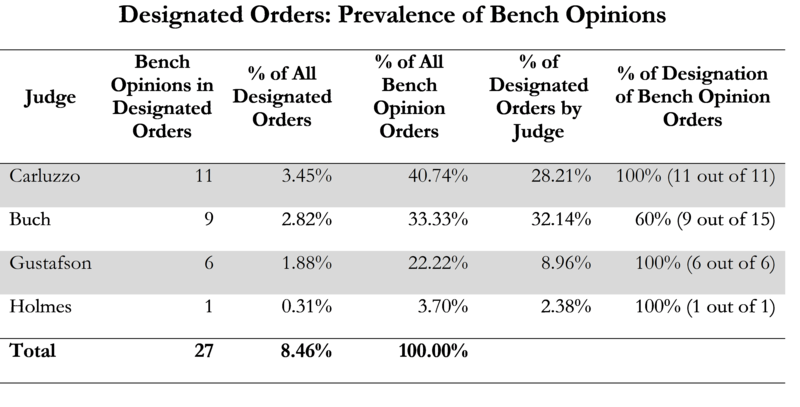 All of the Special Trial Judges designated orders and did so frequently, accounting for 29.47% of all designated orders. Judges have also used Designated Orders to highlight bench opinions with substantive tax issues. A bench opinion is one rendered orally at a trial session that disposes of the entire case. After the transcript is prepared, the judge then orders transmittal of the bench opinion to the parties under Rule 152(b). For an example, see Chief Special Trial Judge Carluzzo’s order in Garza v. Commissioner. These transmittal orders represent 8.46% of all designated orders. Judge Carluzzo issued 11 such orders, followed closed by Judges Gustafson and Buch at 9 and 6 orders, respectively. Judges Carluzzo, Gustafson, and Holmes designated every order that transmitted a bench opinion, while Judge Buch had some undesignated bench opinions (there were 80 other undesignated bench opinions from other judges, which represent the vast majority). Some cases are repeat players in designated orders. Twenty-nine dockets received more than one designated order during the research period. Three dockets received three or more orders, two of which were among the most well-known cases then before the Tax Court: Docket No. 18254-17L, Kestin v. Commissioner (three orders); Docket No. 31183-15, Coca-Cola Co. v. Commissioner (three orders); and Docket No. 17152-13, Estate of Michael Jackson v. Commissioner (seven orders). 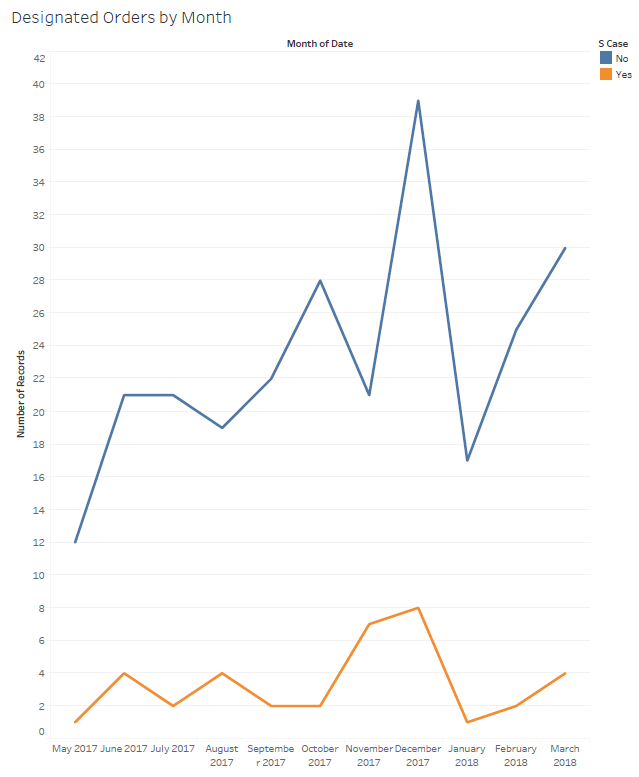 From a timing perspective, the Court’s orders seem to peak in December and March and drop off in January and May—both for regular and S cases. I’ll leave it to those with access to better data to inform us whether this corresponds with the Tax Court’s overall production during these times. A substantial number of judges do not designate orders at all, or do so very seldom. Do these judges issue substantially more opinions? Are these judges’ workloads substantively different from those who do issue more designated orders? Three judges (Judges Gustafson, Holmes, and Carluzzo) accounted for nearly half of all designated orders. Why is there such a disparity between these judges and the rest of the Court? Judges issued only 112 bench opinions during the research period. (To get this figure I searched for “152(b)” on the Order Search tool for each judge between April 15, 2017 and April 15, 2018.) This strikes me as minute compared with the overall number of cases (2,244 cases closed during April 2018 alone). Keith has long argued to increase the use of bench opinions to resolve cases; the Court appears to have disregarded his advice. Of the 112 bench opinions, only 26 (23%) were designated. Judges might consider designating these orders such that they highlight their bench opinions to the public. There is a large disparity in small cases on the docket (37% of all cases) with designated orders in small tax cases (12.85% of all designated orders). Are small cases simply too “routine” and less deserving of highlighting to the public? Ideally, the Tax Court would publish its own statistical analysis of its cases, orders, and opinions, as Professor Lederman suggests. Perhaps the Court can discuss and address some of my questions above in so doing. In addition, the Court should allow public users to filter orders on the Tax Court’s website by whether the orders were designated. In the meantime, we will continue to track these orders so that practitioners and researchers alike keep abreast of important developments at the Court. We’ve learned a great deal about certain substantive topics through this project —especially about penalty approval under section 6751. I further hope these statistics on designated orders shed some light on the Court’s sometimes opaque operations. Unless the Court, as it should, decides to take up the mantle itself, we’ll continue to track, summarize, and look at trends stemming from these orders. A huge thanks to the judges of the United States Tax Court for issuing few substantive designated orders during the first week of classes. We only have three orders deserving discussion this week. Other designated orders included four orders from Judge Jacobs: a routine scheduling order, an order allowing petitioner’s counsel to withdraw, and two discovery orders in the same case. Judge Halpern also dismissed the Krug v. Commissioner case on his own motion because the Petitioner failed to prosecute the case. Krug, which we covered previously, raised interesting substantive issues about withholding on prisoner income in the whistleblower context. Sadly, we won’t see a substantive conclusion to this case for the time being. For the cases that follow, I must admit I rolled my eyes a bit at the results. Both betrayed my own intuition of how the cases ought to be resolved—though ultimately for somewhat good reasons. The first case strikes me as reaching for a technical result without consideration of the practicalities of pro se taxpayers, while I find the second correctly decided, even if clearly erroneous as to the ultimate tax result. Judge Armen’s order in Heath highlights an issue that LITC practitioners see from time to time. Taxpayers file a joint return; the IRS then conducts an audit and issues a Notice of Deficiency to both taxpayers. For whatever reason, only one taxpayer signs and files a Tax Court petition. Trouble ensues. Taxpayers who owe a debt relating to a jointly filed tax return are, under section 6013(d)(3), jointly and severally liable for that debt. Thus, the Service can levy both taxpayers’ assets to satisfy the liability. This applies not only to self-assessed debts reported on a return, but also to debts arising from a Notice of Deficiency. Under section 6213(a), the Service may neither assess nor collect such a deficiency-related debt until 90 days after issuing the Notice of Deficiency. If the taxpayer files a petition in Tax Court, this prohibition lasts until the case becomes final. What happens if only one taxpayer subject to a joint Notice of Deficiency files in Tax Court? Assessment and collection against that taxpayer is barred under section 6213. But the Service may and will assess the tax (90 days after issuance of the Notice of Deficiency) against the other joint filer. That other filer can get into the Tax Court case—and receive protection against assessment and collection—in certain circumstances. To do so, this “omitted” petitioner would need to either (1) file their own petition before the 90 days expires or (2) cause the already-filed petitioner to amend their petition under Rule 41. An omitted petitioner may always successfully get into Tax Court before the 90 days expires, but after that, the omitted petitioner’s options are limited by that veritable refrain: “The Tax Court is a court of limited jurisdiction.” Under Rule 34, the Tax Court views jurisdiction as depending on the timely filing of a petition on the part of each petitioner subject to a Notice of Deficiency. Thus, the individual prohibition on assessment and collection for the petitioning spouse is of limited value, especially where the spouses have joint liquid assets or the non-petitioning spouse earns the majority of household income. In these cases, taxpayers must simultaneously prosecute their cases in Tax Court and defend themselves against IRS Collections. Even outside of those situations, no one likes IRS notices coming through the mail, regardless to whom they’re addressed. The notices must undoubtedly confuse the taxpayers, who believed they had successfully petitioned the Tax Court for a fresh look at their case. Why would a spouse fail to sign a Tax Court petition? In one of my cases, my client’s spouse passed away before the audit even began, and my client couldn’t afford to open an estate to obtain authority to sign the petition on behalf of her deceased husband. In others, the tax issue may result solely from one spouse’s income or other tax issue. Knowing this, a pro se petitioner may not realize that both spouse’s signatures are required on the petition. They may view the tax dispute as only that spouse’s problem—one that that spouse will resolve independently. There are also very limited indications to pro se taxpayers that both spouses must sign a Tax Court petition to avoid IRS Collections. While Notices of Deficiency are issued to both spouses, those living at the same address may just see this as typical IRS notice duplication. The Tax Court form petition, while suggesting “Spouse” as an example of an “additional petitioner”, gives no clear indication that failure of both spouses to sign could lead to these very serious consequences. Nevertheless, Rule 60(a) provides an opening if the original petitioner can show that they also brought the case on behalf of the omitted petitioner. The omitted petitioner may thereby “ratify” the original petition, which will date back to the time of filing under Rule 41. To do so, the original petitioner must show that they (1) were authorized to file the petition on behalf of the omitted petitioner and (2) objectively intended to do so. Indicia of objective intent appear to be: the original petition’s caption; pronoun usage in the petition and attachments (i.e., first-person plural vs. singular); and the delay between the petition’s filing and attempts to correct the petition. But only Mrs. Heath filed and signed the petition. Eventually, Mrs. Heath retained counsel (the Tax Clinic at the Chicago-Kent College of Law), who noticed the issue and seeking to add Mr. Heath to the Tax Court case, filed the present motion. – Counsel didn’t enter an appearance for husband. Of these reasons, only two appear relevant to me: (1) Mrs. Heath captioned the case in her name alone and (2) a ratification wasn’t filed until the Court’s order in June 2018. The rest are tautological, irrelevant, or—with more explanation—not indicative of a lack of intent. All cases involving these disputes will, without question, involve a petitioner who signed and filed the petition herself. Most such cases will also involve adjustments that only pertain to one petitioner; petitioner’s admission thereof in this motion thus doesn’t seem terribly relevant to this inquiry. Handwriting a petition seems neutral on the intent question. Finally, first-person singular language may be relevant, but in the seminal case on this topic, Brooks v. Commissioner, 63 T.C. 709 (1975), such language was present, yet the Court found an objective intent to file a petition on behalf of the taxpayer’s wife. The timing issues all seem consistent with the underlying causes of petitioner’s challenge in Brooks: the petitioner first raises the issue once he or she notices it. In Brooks, a petition was filed in December 1974 and Brooks began challenging the issue in February 1975—fairly quick! But Brooks had a cue that the Heaths lacked: Respondent’s motion to dismiss for lack of jurisdiction. Because Mr. Brooks included Mrs. Brooks in the caption, but she didn’t sign the petition, Respondent sought to remove him from the case. Here, only Mrs. Heath appeared on the caption. So, Respondent didn’t bug the Heaths about the issue. Only after the Service’s machinery (1) assessed the tax, and (2) started sending notices to the Heaths, could they have possibly discovered that Mr. Heath was in jeopardy. So yes—of course, the Heaths only took steps to resolve the issue once they discovered it, through the collection notices sent to Mr. Heath. The petition was filed on March 13, 2017, meaning that the IRS likely didn’t start sending out notices until mid-summer 2017 at the earliest. Counsel was retained in September 2017. Admittedly, the motion wasn’t filed until March 2018, but this doesn’t necessarily indicate Mrs. Heath’s lack of an objective intent to file a petition on behalf of her husband. The Heaths were also sorting through respondent’s motion for summary judgment at the time. Finally, Counsel could not have easily entered an appearance for husband through the Court’s electronic filing system. Mr. Heath was not a party to the case in September 2017, so he would not appear as a party one could represent when e-filing an entry of appearance. While a paper could be filed purporting to represent Mr. Heath, the electronic filing system would treat the paper’s caption as applicable only to Mrs. Heath. Moreover, this factor seems only tangentially relevant to the underlying issue: did Mrs. Heath intend to file a petition on behalf of Mr. Heath? More fundamentally, what does it mean to have intent to file a petition at all? Must Mrs. Heath have intended to file a particular piece of paper on behalf of Mr. Heath? Why is that so seemingly important to the jurisdictional question? The Court might reframe its intent analysis in terms of the petition’s function—not the petition as a document. A timely filed petition provides (1) independent judicial review of the Service’s determination and (2) protection from assessment and collection while that review occurs. Surely Mrs. Heath desired this both for herself and her husband—particularly if they shared joint assets or income. There may be circumstances where spouses do not intend those results; the Court could decline to exercise jurisdiction in such a case. Notwithstanding that she likely possessed that intent, Mrs. Heath likely finds herself subject to IRS collections while the Tax Court case proceeds. It appears as if she believed the issue shouldn’t ultimately have anything to do with her husband, given her substantive argument that the Schedules K-1 are incorrect. Whether she knew the adverse consequences of failing to file a joint petition seems irrelevant. In any case, Judge Armen denies the motion, but suggests that the IRS defer collections administratively. Here’s hoping that Counsel follows that reasonable suggestion. This case had two orders: one on Respondents motion for entry of decision under Rule 155 and one on Respondent’s motion to reopen to supplement the record per Graev III. Ultimately, Judge Gustafson grants the latter motion, because petitioner didn’t object to it. Nevertheless, he sets forth a very thorough primer on the hearsay and authentication issues under the Federal Rules of Evidence, given potential concern with the taxpayer’s pro se status. He finds that form falls into the FRE 803(6) exception of a regularly conducted activity, and that it is a self-authenticating document record under FRE 902(11). Rather than describe the details here, I strongly suggest you read Judge Gustafson’s order in full. The other motion is fairly interesting. Apparently, petitioner deducted $7,400 on his return as a charitable contribution. The Notice of Deficiency disallowed this in full. Petitioner fully conceded this issue, so this should have been a $7,400 adjustment, right? Well, petitioner also submitted an amended return to IRS counsel at some point, which reported a reduced charitable contribution of $4,700. The Service never processed this return, but somehow it wound up before Judge Gustafson as an exhibit. Judge Gustafson disposed of this case via a bench opinion. He orally noted that the Notice of Deficiency’s $7,400 adjustment appeared incorrect, looking as he was at the $4,700 deduction apparently claimed on Schedule A of the amended return. As with most Tax Court cases, this one is ultimately resolved under Rule 155. The Court itself doesn’t determine the ultimate tax result; instead, the Service issues a computation based on the Court’s decision. Here, the computations came back with a $7,400 deduction. Substantively correct—but in violation of Judge Gustafson’s decision in the bench opinion. That’s a no-no under Rule 155. Rule 155(c) specifically proscribes reconsideration of the decision itself. It’s “not a remedy for correcting errors.” Indeed, it’s difficult to intuitively ascertain whether an adjustment of this sort appears in a Rule 155 computation; indeed, there’s nothing that would “flag” the issue, as a more substantive motion would. So, in response to the Rule 155 motion, Judge Gustafson orders the IRS to show cause why there should not be a supplemental computation reducing the adjustment to $4,700, as originally decided in the bench opinion. This may all seem like a lot of work to get to the wrong tax result. But there’s an important principle that emerges: the Service may not simply correct the Tax Court’s error by fiat through computations. If the Service (or petitioner) believes a decision to be wrongly decided, they must either move for reconsideration or appeal, so that the Court can fully consider respondent’s arguments, hear any objections from petitioner, and firmly decide the ultimate liability. While he suggests that the Court may have jurisdiction to reconsider the decision sua sponte, he declines to do so. (It also appears Judge Gustafson exhibits some reticence to a now very untimely motion for reconsideration). To date the Service has not responded substantively to this order, but has received additional time to do so. We will keep an eye on further developments here.